The Castel Sant Angelo (Castle of the Holy Angel) is one of the great sights in Rome and is one of the largest and most important ancient buildings in the world. The castle is located almost directly on the river Tiber (Tevere), only a few hundred metres from the Vatican. For many tourists, a visit to the interior of the Castel Sant Angelo is one of the highlights of a trip to Rome. The castle is an antique building from the 2nd century after Christ. For many centuries it was a refuge of the popes in danger from the Vatican, only a few hundred metres away. 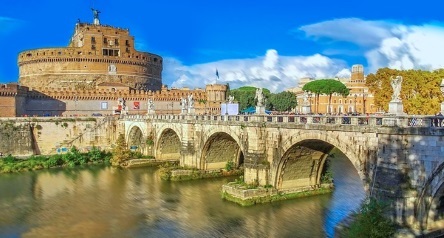 Most visitors cross the Aelius Bridge over the Tiber from the city centre to Castel Sant Angelo. You should first circumnavigate the gigantic cylinder from the outside to see the dimensions. The queue at the entrance is usually long. Those who already bought an entrance ticket for the Castle of the Holy Angel in the internet before, you do not have to wait hours in the long queues. There are different entrance fees to the Castel Sant Angelo in Rome. Those who want to queue in the long line pay a few euros less. But it is better to buy a ticket for the Castle of the Holy Angel on the internet before. Hours of queuing are not necessary. We recommend that you buy an admission ticket in advance on the Internet, including an audio guide. Such tickets for the Castel Sant Angelo can be found on this good website. The Castel Sant’Angelo is open every day except Monday from 9 am to 7:30 pm. In addition, New Year’s Day, Labour Day (1 May) and Christmas Day the sight is closed. In the high season from the end of June to around mid-September, the opening hours of Castel Sant Angelo are even extended to midnight (this was at least the case in summer 2017). We recommend the visit of the Castel Sant Angelo because of the great view rather in daylight. Of course, the view from above to Rome at night is also interesting. For many centuries the Castle Sant’Angelo and the very near Vatican were closely connected by a secret passage. Today there is a great guided tours in Rome for both major sights. The tour is in English (duration 3 hours) available. >>> More information, dates, prices and bookings on the well-known website Getyourguide. After a long queue we could finally buy a ticket at the cash desk and entered the castle. It leads a long way over about five high floors slowly upwards. At the top is a panorama terrace with a wonderful view to the Vatican, the river Tiber and many other sights in Rome. First there are some stairs between thick walls to the top, in different floors you have a better and better view to Rome with increasing height. At the beginning, you are mostly outside, later you get through different rooms. At the highest point is a great terrace with a magnificent view of Rome. For just the panorama, the entrance to the angel castle was actually worthwhile. You can look in many directions, the views of many visitors are towards the Vatican. On the way up and even more on the way down you get through many interesting rooms, some of which are decorated with great works of art. Some are the living rooms and study rooms of former popes, but you also see a former library. But the gigantic dimensions of the castle in Rome and the thick walls are especially impressive. In some places you can see cannons, other weapons, heavy chains and other objects from the very long history of Castel Sant Angelo. The way and the direction are given for the castle visitors. The circular route through the Castel Sant’Angelo is quite long We were with the usual breaks somewhat more than 90 minutes walking. The way goes first constantly upwards, then slowly downwards again. Although I suffer a little from fear of heights, this was no problem in the Castel Sant Angelo, in contrast to some church towers for example. The stairs and paths are quite easy to walk on and, according to our impression, relatively easy to do for normal people without walking problems. On the upper floor there is a café with a good view (coffee from 2.50 euros in 2018). There is also a clean toilet (free of charge). Disabled people with wheelchairs can only visit a part of the Castel Sant’Angelo as far as we know. There is a toilet fordisabled people just after the entrance. The Castel Sant’Angelo is an ancient building and was built as a mausoleum (tomb) for the Roman Emperor Hadrian. Shortly after Hadrian’s death in 138 AD, the gigantic fort was completed. Later, six other Roman emperors found their last place in the Castel Sant’Angelo (at that time the name of the mausoleum was Hadrianeum). The round castle with its thick walls and about 65 metres in diameter was used as a fortress starting in the Middle Ages. In case of danger, several popes found refuge in Castel Sant Angelo. Famous is a secret passage about 800 meters long between the nearby Vatican and the Castel Sant’Angelo. The connecting passage that has survived until today is called Passetto di Borgo or Corridoio di Borgo. Several popes furnished complete rooms in the castle. The interesting rooms, which bear the names of the respective popes, can be visited today during the visit of the angel castle. For a long time, Castel Sant Angelo was also a prison. 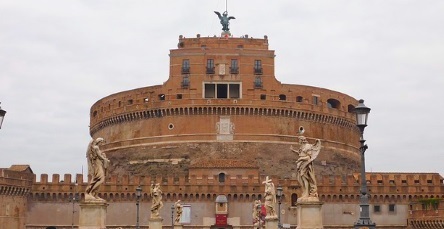 For more than 100 years now the Castel Sant’Angelo has been a museum and open to the public. It is one of the largest antique buildings in Europe and a great sight to see. There is no subway station of the Metro Rome in the immediate vicinity. The nearest metro station is Ottaviano, about 15 minutes walk away. The distance from the Castel Sant Angelo to the Vatican (St. Peter’s Basilica) is only a little more than 500 meters. You can combine both sights and visit them in one day. You can also walk from the city centre of Rome to the Castel Sant’Angelo. For example, the distance from the Pantheon is a little more than one kilometre. From the area around the Spanish Stairs it is a little further, about 30 minutes walking time. Of course, you can also take the public bus to Castel Sant Angelo. But in our opinion it is better to walk from the centre. Until you have found the right bus and the bus arrives, you are often already there on foot.